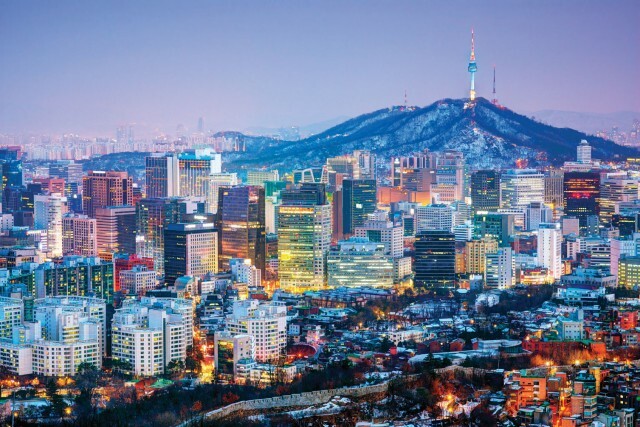 AS THE MODERN capital of South KOREA, Seoul has a varied and vibrant character that reflects an ancient heritage as well as rebuilding and urban development in the post-World War II period. It ranks as the fifthlargest city in the world and has a population of some 10.8 million. It is situated in the Han River basin near the coast in the northwest province of Kyonggi-do and lies some 38 mi (60 km) south of the demilitarized zone (DMZ), which has separated North and South Korea since the end of the Korean War in 1953. Seoul enjoys a temperate climate with an average temperature ranging from 7.3 degrees F (-13.7 degrees C) in January to 97 degrees F (36.1 degrees C) in July; there is an annual precipitation of 47.2 in (121 cm), which falls mainly during the late summer monsoon months. The origins of Seoul date back to 4000 B.C.E. when Neolithic (New Stone Age) peoples settled in the Han basin. However, the first written records of Korea are in Chinese, reflecting the presence of Chinese overlords in the Korean peninsula about 2,000 years ago. At this time a town called Wiryesong was established on the south bank of the Han as the capital of the Baekje kingdom, which persisted between the 3rd and 7th centuries C.E. During this time, the Korean peninsula was ruled from three centers; thus it is known as the Three Kingdoms Period. In the Seoul area, the Baekje kingdom was superseded by the Silla kingdom; Wiryesong lost its power and was renamed Hansong. The next kingdom, the Goryeo, from which Korea derives its name, was established in 918 by a soldier from the northern kingdom of Gogureo, and Hansong became Yangju, one of three secondary capitals. Despite invading Mongol influence in the 13th century, the Goryeo kingdom persisted. By 1392, the Chosun dynasty was founded by Yi Songgye, a Korean general who fought the Ming Chinese and deposed the ruling Korean king. He established Yangju as the capital and renamed it Hanyang. It eventually became known as Seoul, which is derived from the Korean word for “capital” and was the center of learning, culture, and government. Population was in the order of 100,000 by the early 15th century and Confucianism rather than Buddhism had become the dominant religion. Although this dynasty persisted until 1910, Seoul and Korea experienced many influences and invasions. The Japanese invasion of 1592, for example, caused much devastation in the city and further upheaval occurred as the Koreans and Chinese collaborated to rout the Japanese. Another Japanese invasion occurred in 1636, when the Manchus took control and Seoul was again badly damaged. By 1700, the Manchus, with Korean collaboration, had expanded into China. For the next 150 years, Korea enjoyed some stability but became known as the hermit kingdom because of its insular and isolationist attitudes. By the mid-1800s, the advent of Christianity altered relationships between the rich and the poor as the latter grew more vociferous and thus new class relationships emerged. Another influence of the time was a new wave of Japanese invaders in 1894, though Korea was not annexed as a colony until 1910. In 1911, Seoul was renamed Kyongsong. The Japanese actively developed Korea by building a railway network, including the railway station in Seoul. Trade, industry, and commerce were encouraged throughout the country, and Seoul became a hub of such activities as well as a military center. Modern Seoul was born. At the end of World War II, the Korean peninsula, rather than being united, was divided; the UNITED STATES controlled the region south of the 38th parallel, while the Soviet Union controlled the region to the north. The Cold War accentuated this split and culminated in the Korean War between 1950 and 1953. It began with a shift south of North Korean troops, who rapidly captured Seoul and a swift counterattack by United Nations forces under U.S. leadership that restored the beleaguered city to South Korean control. The Chinese assisted the North Koreans, and the country and Seoul experienced considerable damage from armaments. Overall, the city was captured twice and retaken twice. The truce of 1948 led to a rebuilding program and the reinstatement of the name Seoul. Between 1950 and 2000, the city was transformed as South Korea has industrialized and become a major component of the so-called tiger economies of East Asia and the Pacific Rim. Development has not stopped with restoration after war. High-rise apartment blocks attest to the city’s high population density as do satellite towns in Seoul’s periphery. Its many hotels attest to affluence, the importance of tourism and its role as the commercial center of Korea. It has industrial, commercial, and retail areas juxtaposed with restored buildings, such as Kyongbok-kung palace, originally constructed in the 14th century. It is a center of culture and learning with no less than 33 universities and many museums, including one dedicated to war that contains poignant reminders of the two Koreas’ and Seoul’s war-ravaged past.